Our #1 priority for the Peak to Brew Relay is to ensure Team and Runner safety on the course and throughout the event. We want everyone to have a fun and amazing experience and be safe while doing so. 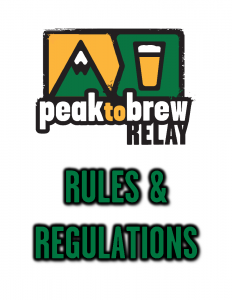 Please be sure for everyone on your Team to familiarize yourself with the Rules and Regulations of the Peak to Brew Relay Race (attached below). If the at anytime the Rules and Regulations set forth by the event are broken you and your Team may be disqualified from the event.